TRANSDATpro performs Coordinate Transformations fast and with high accuracy. 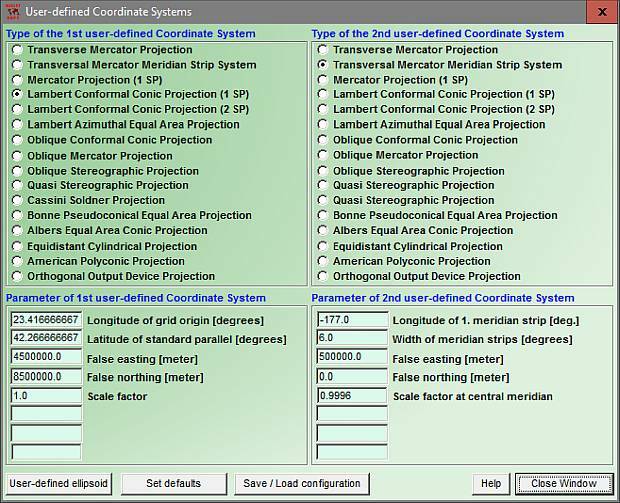 The coordinate conversion software supports worldwide thousands of Coordinate Systems, geodetic Reference Systems and Datum Shifts, user-defined systems, 2D/3D transformations, INSPIRE, NTv2, HARN, EPSG, GPS, continental drift and more. The geographic calculator reads and writes the file systems Text, CSV, SDF, dBase, Arc-Shape, Arc-Generate, KML, GPX and others. Furthermore: Outdoor GPS reception, mapping in Google Earth, Google Maps and OpenStreetMap, Meridian Convergence and Extra Parameter, Polygonal scopes in NTv2 files, multilingual user interface. Basic and Professional Editions have been combined to new TRANSDATpro. New CRS Google World, Pixel and Tile Coordinates Zoom levels 0 - 23. Final NTv2 systems of the federal states Bavaria and Baden-Wuerttemberg. New NTv2 Reference Systems of Great Britain, Hungary and Venezuela. WGS84 (GPS) to ETRS89 und NAD83 (ITRSyear) complemented and refined. New CRS of Australia MGA2020 / GDA2020 with NTv2 support. Since 1993 KilletSoft's TRANSDATpro has been the coordinate conversion tool of first choice for GIS professionals, land surveyors and geodesists around the world. TRANSDATpro continuously gained in popularity since then and has maintained its reputation as one of the best coordinate conversion tools on the market. Additionally TRANSDATpro contains many more advanced geomatic tools such as 2D / 3D transformations, NTv2 and HARN grid shifts, GPS receiver module, considering of Continental Drift, INSPIRE- and EPSG support, and the ability to use custom best fit transformation parameters. TRANSDATpro has grown with many improvements over the years and it continuously benefits from user feedback. Thanks to the numerous improvement suggestions of the users the quality and the functionality of the program increase constantly. Besides the usual Geographic Information Systems (GIS), there is a wide variety of geodetic applications and data collections that are used for the acquisition, processing and presentation of spatial data. The thereby used spatial data are available in many different coordinate systems and reference systems. Here the program TRANSDATpro is needed to transform the spatial data of different data sources and data structures from one coordinate reference system (CRS) to another. TRANSDATpro has been developed on the basis of the Geodetic Development Kit GeoDLL, which allows to embed geodetic calculations in own computer programs. 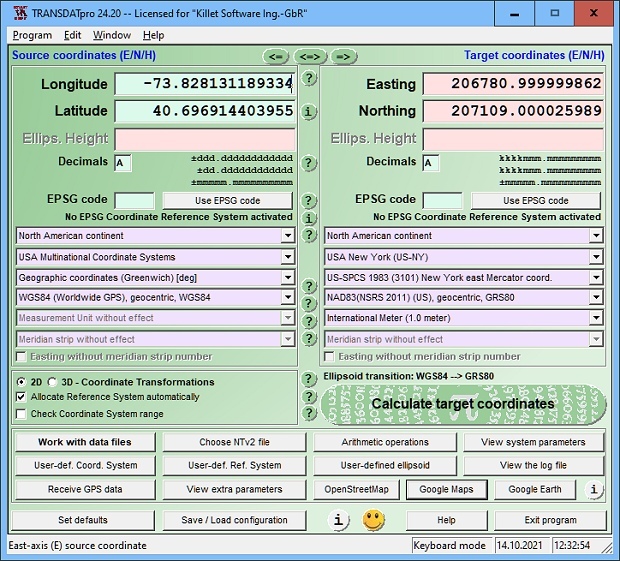 TRANSDATpro is a professional computer program for Geodetic Coordinate Transformations between national and country-specific Coordinate and Reference Systems with high precision and good performance:. You find a complete list of the supported Coordinate and Reference Systems on our internet site and after downloading (see above) the free test version as part of the documentation. TRANSDATpro supports all by the INSPIRE directive prescribed ETRS89 conversions with NTv2 grid data, e,g. Gauss-Kruger / DHDN to UTM / ETRS89 with BeTA2007. The NTv2 standard with national gridfiles is worldwide full supported. The use of EPSG codes for the Coordinate Reference Systems is possible. Apart from the given worldwide and state-specific systems, your own personal Coordinate Systems and geodetic Reference Systems can be defined with Helmert (Bursa / Wolf, ISO19111) or Molodensky Parameters. Calculations can be performed with coordinates entered directly, loaded from files in various formats (Text, CSV, SDF, dBase, KML, GPX, ArcShape and ArcGenerate), or passed via batch processing. Arc-Shapefiles can be viewed with the program-internal Shape Viewer. A programmable GPS interface makes it possible to read coordinates into a notebook computer from a low-cost GPS antenna. The program has a user-selectable multi language interface and comes with extensive online help. The program can be run on most common networks and it is possible to use Terminal Services on WINDOWS Servers. In case of a network installation the clients are installed automatically by the program. Additional to in TRANSDATpro predefined Coordinate and Reference Systems listed under the link above, user defined Coordinate Systems can be used by the input of the necessary transformation parameters. 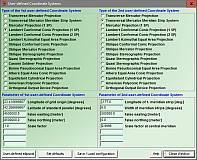 During Coordinate System selection, the appropriate Reference System can be selected automatically or independent from the Coordinate System. The Reference Systems listed under the link above can be used for geodetic datum shift in both source and target Coordinate Systems. It is also possible to setup user-defined Reference Systems for transformations into regional grids or custom Coordinate Systems. The transformation parameters include three translation vectors, three rotation angles and a scale factor in case of the Helmert transformation "Coordinate Frame Rotation" or "Position Vector Transformation" datum shift, or three translation vectors in case of Molodensky three parameters datum shift. User defined Coordinate Systems and user defined Reference Systems require the definition of suitable earth ellipsoids. The definition effected via the selection of pre defined ellipsoids or via the input of the semi axes of the source and target ellipsoids. Exact datum shifts in local systems are possible by supporting the NTv2 standard with gridfiles. The selection of the continents, countries, coordinate systems, reference systems and meridian strips can be simplified by the direct input of EPSG codes. The source coordinates can be entered directly into the input fields of the program window and transformed using the previously selected settings. The calculated results will be displayed. The program will automatically save the entered source coordinates and the calculated target coordinates to a log file. You can review and retrieve log file contents using external programs. It is very important to be able to perform fast calculations on large amounts of coordinate data stored in files of different file formats. TRANSDATpro allows loading data from Text, CSV, SDF, dBase, ArcShape and ArcGenerate input files. A large number of Setup options allow the adjusting to different input file data structures. Calculated coordinates can be stored in Text, CSV, SDF ,dBase, KML, GPX, ArcShape and ArcGenerate output files. Here again TRANSDATpro offers a large number of program Setup options for the output file structure. During the file handling the unrestricted conversion between the data formats named above is possible with or without Coordinate Transformations. Geometries saved as Arc-Shapefiles can be viewed in the programs internal shape viewer. Geometries saved as KML and GPX files can be viewed in Google Earth directly. The conversion of the data formats for example makes possible the transfer of geometries contained in ArcView and ARC/INFO Shapefiles and in ARC/INFO Generate files to KML and GPX files, which can be used in Google Maps / Earth and OpenStreetMap. A further interesting example is the transformation of the geometries contained in Arc-Shapefiles and Arc-Generatefiles to other Coordinate Systems. TRANSDATpro is able to convert between Arc-Generatefiles, Arc-Shapefiles and KML and GPX files, taking account of point, line and polygon shapes. Line by line copying from Text files is particularly efficient, whereby the transformed coordinates are inserted in place of the original coordinates inside the text. The search for coordinates scattered arranged in the text and their conversion is possible. The flexibility of the program TRANSDATpro opens a large count of further conversion possibilities, e.g. the use of filters. The batch processing allows the automatic execution of one or more files using a batch file. Thus makes the program TRANSDATpro controllable from other programs or it can transform large amounts of coordinates unsupervised. TRANSDATpro uses Coordinate Transformation formulas based upon EPSG specifications and publications by Schatz, Schuhr and Klotz and Hooijberg. Algorithms used for country-specific transformations are either published or made directly available by the Measurement Authorities of the respective countries or by similar respectable institutions. To achieve the highest precision only strong formula algorithms are used for calculations. Coordinate Transformations without changing the geodetic Reference System have extremely high precision ranging within millimeters. A good example of geographic coordinates transformations between Gauss-Kruger and UTM Coordinate Systems made with TRANSDATpro are the results published by the North-Rhine Westphalia Land Survey Commission. It was confirmed that the differences were within the lower millimeter range. For a statement about the accuracy were comparative calculations realized with a set of test data of the "Arbeitsgemeinschaft der Vermessungsverwaltungen der Länder der Bundesrepublik Deutschland" (ADV). It was confirmed that the differences were less then a millimeter. Please read the test report. Shapefiles of the GIS ArcView and ARC/INFO can be converted directly into an other Coordinate System while maintaining the internal data structure. 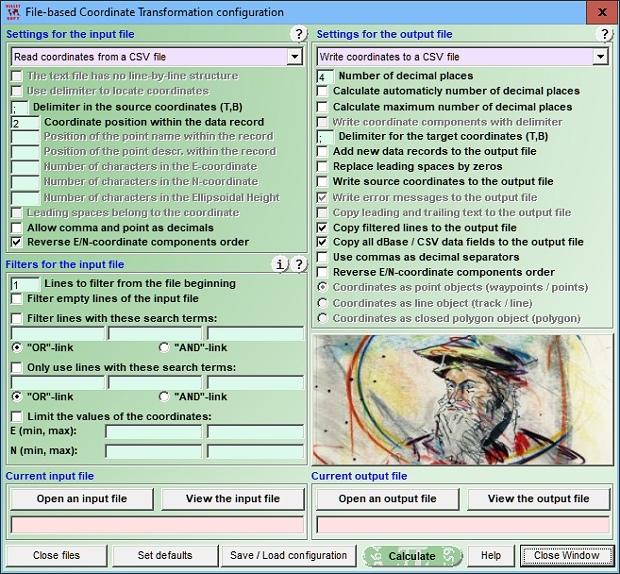 During the file handling the unrestricted conversion between the data formats Text, CSV, SDF ,dBase, KML, GPX, ArcShape and ArcGenerate with or without Coordinate Transformation is possible. TRANSDATpro converts ArcGenerate and ArcShape point, line and polygon geometries into KML and GPX files. Geometries generated as KML and GPX files can be viewed in Google Earth directly. In Arc-Shapefiles available geometries can be represented in the program internal Shape Viewer. The program TRANSDATpro is equipped with a modern graphical user interface of which handling is to understand intuitively. For each window detailed help texts can be shown. The detailed electronic documentation of the program TRANSDATpro is available in both English and German language. However, the user interface can be represented in many languages. For this purpose, external language files are used. When starting the program, it notes which language files are available in the calling directory. The found languages then are provided for selection in a list box. By creating new language files, new languages can be added to the program TRANSDATpro at any time. Teh program TRANSDATpro can be run on most common networks. The client installations works automatically. It is possible to use Terminal Services on WINDOWS Servers like e.g. "Citrix Terminal Server". TRANSDATpro has an integrated GPS interface to receive coordinates, speeds and motion directions with an inexpensive GPS antenna connected to a serial or USB interface. In a graphical window up to 2500 GPS positions are shown. 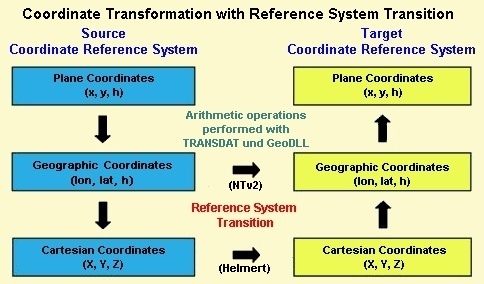 It is possible to integrate the geodetic functions for Coordinate Transformations used by TRANSDATpro via WINDOWS DLL (Dynamic Link Library) into own programs. All in TRANSDATpro used geodetic transformations and calculations are contained in our Geodetic Development Kit GeoDLL. Using GeoDLL to perform geodetic calculations in your applications will save you time and expense necessary for development of geodetic transformation routines. TRANSDATpro is a quite complex application. To ensure stable performance it should be installed on a personal computer with a processor not less than Pentium and at least 32 MB RAM available. The program will run under Microsoft WINDOWS 2000 / XP / NT / Vista / 7 / 8 and compatible operating systems.